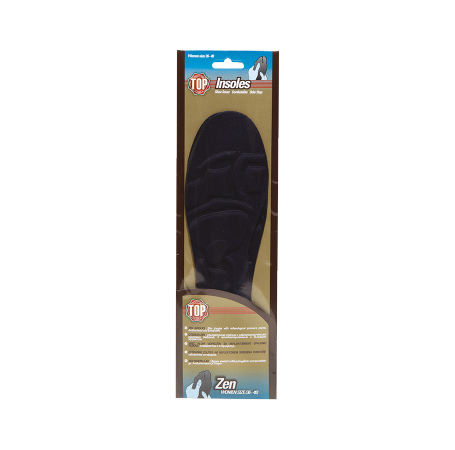 Extrafine insole with pressure points reflex. Antibacterial and breathable. Universal size women 36-40. Cut out the insoles to the desired size by following the printed broken line. Place them inside the shoe in such a way that the side with the reflexological pads is in contact with the foot. This insole is based on the Chinese therapeutic practice of plantar reflexology, according to which different parts of the body can benefit by massaging different parts of the foot associated with them. Massaging the reflexological pressure points also stimulates microcirculation in the feet and legs. The special "AIRFOAM" material guarantees thermoregulation and recirculation of the air inside the shoe. The formation of fungus and bacteria is prevented in this way.